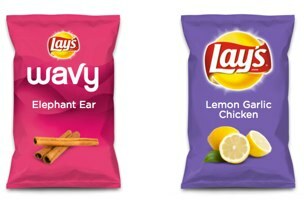 Lay’s Revives ‘Do Us A Flavor’ Contest: Sushi-Flavored Chips, Anyone? All hail the return of Lay’s uber-successful crowd-sourced product-development promotion, Do Us a Flavor! In case you’ve forgotten, this is the contest that urges chip-lovers to get creative by suggesting new and outrageous flavors that will then be voted on by fellow customers, ultimately yielding tangible, edible versions of the top contenders. Oh, and there’s the small matter of the million-dollar prize money. Last year’s winners were Cheesy Garlic Bread, Sriracha, and Chicken & Waffles, and if the recent submissions are any indication, this year’s contest is shaping up to be even stranger (read: more awesome) — Wisconsin Beer Brats, Coconut Sprinkle Birthday Cake, Bacon, and Spicy Crab Cakes are just a few of the possibilites you can vote for on the microsite. And in case you’re in need of a little inspiration, Lay’s new TV spot is sure to get the creative (and perhaps digestive?) juices flowing — Sushi-flavored chips, anyone?